After the Second World War Britain had a major housing shortage. In a radical solution, the government built thousands of prefabricated homes or 'prefabs', especially in London and other large cities, as a temporary replacement for housing that had been destroyed by bombs. About 150 were built in Larkhill Road in a six-week period in late 1946. For a better idea of where they were built see the aerial photograph below. The single-storey prefabs were manufactured off-site in advance, in standard sections, that could be easily shipped and quickly assembled. The advantage over traditional housing was its exceptional speed of completion combined with a comparatively very low cost. Indeed the record time for completing a prefab, including all services, was under an hour. Built on top of pre-plumbed concrete slabs, these Yeovil homes were often built by teams of Italian prisoners-of-war who were in no hurry to return home, come the peace. In fact, much of Larkhill Road itself and some other Yeovil roads were built by Italian prisoners-of-war. Despite the intention that these dwellings would be a strictly temporary measure - they were designed to last for 10 years - many remained inhabited for years and even decades after the end of the war. Indeed, the majority of the Larkhill Road prefabs were demolished in the 1960's. The prefabs had two bedrooms with the smaller, at the front of the house, generally being used by the children. Storage was provided by built-in wardrobes. There was also a hallway, living room and a fitted kitchen that was planned to make the most efficient use of the space available, with hot and cold running water, a cooker and a built-in refrigerator - a luxury for most people at that time. It also boasted a fitted bathroom with a heated towel rail and a separate indoors toilet - another luxury and something often missing in 'normal' homes of the time! The coal fire in the living room had a back boiler which heated water for the bathroom and kitchen and also provided ducted warm air to the bedrooms. The major complaint of those who occupied the prefabs was that they were often damp and were very difficult to heat in winter and became too hot in summer. In 1956 it cost £1/0/6d rent per week, including rates and water (just over £22 per week at today's value). The following article is from the Somerset County Herald's edition of 12 October 1946. Many thanks to Rob Baker for forwarding the article to me. A new world record for the erection of a prefabricated house was set up at Yeovil yesterday (Thursday) when a time of 40 minutes 27 seconds was claimed. This new record reduces by 18 minutes 3 seconds the time taken on Tuesday by the same team of erectors employed by Prefabricated Constructions Ltd, working on the Larkhill Estate, who had a house ready for occupation by a tenant in 58½ minutes. As reported, this time was claimed as a world record but it was short-lived, for on Wednesday another team working at Weston-super-Mare put in a claim to have beaten it with a time of 41 minutes 30 seconds. When the team at Yeovil learnt of this latest achievement and that the Weston erectors had clipped 17 minutes off their day-old record they decided to make a further attempt, and yesterday they succeeded in taking another 1 minute 3 seconds off the time. 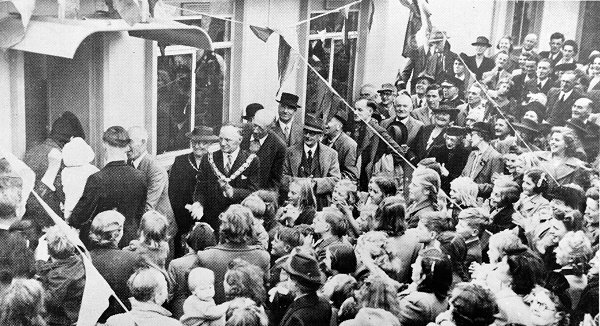 The official opening of the first Larkhill Road 'prefab' by Mayor William Vosper, left of centre, in the early 1940s. 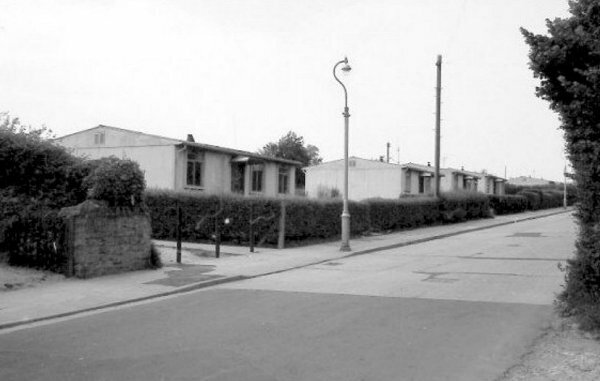 Prefabs on Larkhill Road, photographed about 1960. 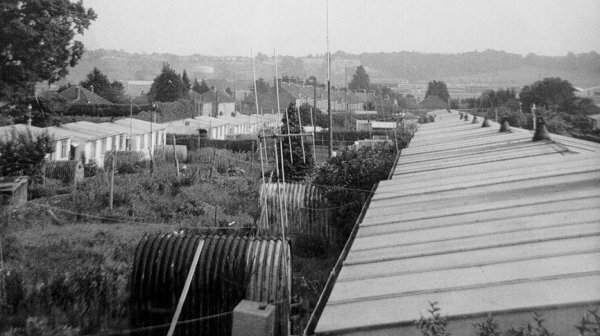 The prefabs of the original Abbey Road (at right) photographed around 1962 by a young Bob March - who apparently got a good ticking off from his parents for climbing on the roof of their home! Note all the Anderson air raid shelters in the rear gardens being used as sheds. 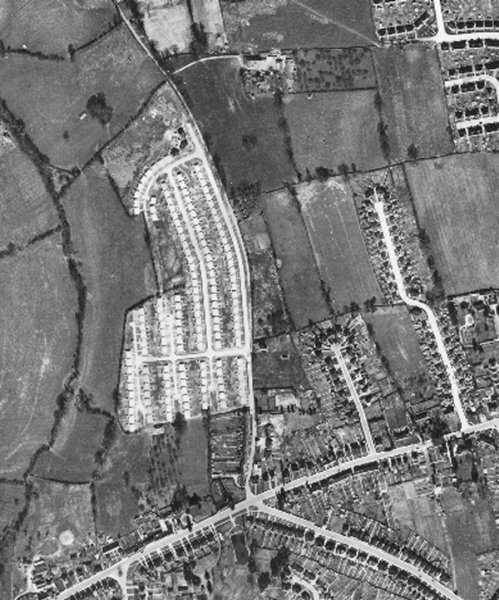 This 1946 aerial photograph clearly shows the development of prefabs in Larkhill Road, at this time little more than a track. Much of Larkhill Road would be built shortly after the Second World War by Italian prisoners of war. Running across the bottom of the photograph is Preston Road and from the junction with Larkhill Road and running to the bottom right corner is Preston Grove. 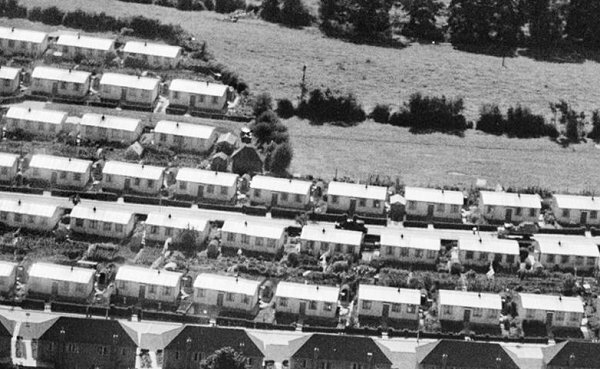 An aerial photograph of the Larkhill pre-fab estate taken in 1953. Preston Road at extreme left. An enlargement from the 1953 aerial photograph above.